Many people always ask "what is the reasonable property price for Iskandar Malaysia compared Singapore?" Below is a simple calculation that will consider some major factors which may affect the property price. We take Singapore as benchmark which all factors are indicated as 1, while IM will be given a relative factor by "benchmarking" to Singapore. The assumptions of calculation are quite straight forward as indicated in the formula below. The default values below are my personal inputs, if you think the values are inappropriate, you may key in your own values, the outcomes will provide you a revised calculated property price of IM based on your inputs, then you can judge if the property price at IM is reasonable or unreasonable to you. Please note, the actual property price is hardly for prediction due to speculation, natural disaster, politic instability, economy performance and etc, however the calculation below is meant to compare the various "values" or factors from both locations, excluding the unpredictable factors. 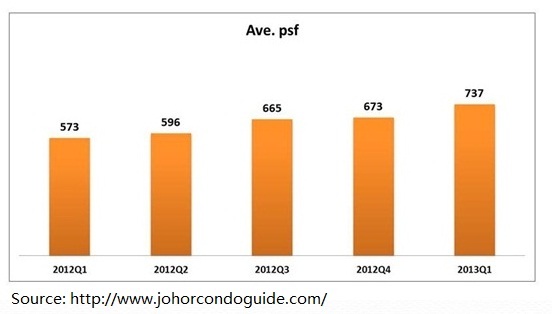 For example below, if the Singapore private property price is SGD1200 psf averagely, based on the calculation , IM shall have RM 689 psf in average value. Have fun!!! Take the outcomes with pinch of salt. Disclaimer: Do not use the outcomes as your investment guides, the demonstration above is just provide a rough comparison between property price in IM and Singapore. What is your reasonable property price (psf) of IM?